To assess bone density at cleaned and activated titanium implants using argon plasma. Mandibular premolars and first molars were extracted bilaterally in eight Beagle dogs. After three months, four implants, two treated with argon plasma (test; plasma) and two left without treatment (control), were randomly installed in one side of the mandible. Abutments were applied on the implants and a non-submerged healing was allowed. After one month, the same surgical procedures were adopted on the opposite side of the mandible. The animals were euthanized after one month and ground sections representing the healing after 1 and 2 months were obtained for histological examination. No statistically significant differences were found between test and control sites (p < 0.05). After 1 month of healing, new bone was 32.5 ± 12.2% and 33.8 ± 8.8% at the plasma and control sites, respectively. After 2 months, the respective values were 50.8 ± 21.5% and 47.6 ± 15.6%. The treatment of the implant surface with argon plasma did not have a significant effect on bone density around implants. Keywords: Osseointegration, Bone density, Dental implants, Plasma gases, Surface properties, Animals. © 2018 Tanaka et al. The surgical trauma and the implant surface will induce a cellular response that will result in bone apposition onto the implant surface [1Rossi F, Lang NP, De Santis E, Morelli F, Favero G, Botticelli D. Bone-healing pattern at the surface of titanium implants: An experimental study in the dog. Clin Oral Implants Res 2014; 25(1): 124-31. [http://dx.doi.org/10.1111/clr.12097] [PMID: 23289845] ]. In an experimental study in rabbits, it was shown that, after implant installation, macrophages, lymphoid cells, neutrophils, and the complement system were activated around implants while RANKL, OPG, cathepsin K, and TRAP were significantly down-regulated [2Trindade R, Albrektsson T, Galli S, Prgomet Z, Tengvall P, Wennerberg A. Osseointegration and foreign body reaction: Titanium implants activate the immune system and suppress bone resorption during the first 4 weeks after implantation. Clin Implant Dent Relat Res 2018; 20(1): 82-91. [http://dx.doi.org/10.1111/cid.12578] [PMID: 29283206] ]. It was concluded that the titanium surface triggered the formation of bone around the implant surface. Several factors may influence osseointegration, such as model used, bone density, loading and surface. Among the various factors considered, the topography of the implant surface plays an important role. Moderately rough surfaces (Sa between 1.0 and 2.0 μm) have been shown to present a stronger bone response than smoother minimally rough (Sa 0.5–1 mm) surfaces or rougher (Sa> 2 mm) surfaces [3Botticelli D, Lang NP. Dynamics of osseointegration in various human and animal models: A comparative analysis. Clin Oral Implants Res 2017; 28(6): 742-8. [http://dx.doi.org/10.1111/clr.12872] [PMID: 27214566] -10Wennerberg A, Albrektsson T, Chrcanovic B. Long-term clinical outcome of implants with different surface modifications. Eur J Oral Implantology 2018; 11(Suppl. 1): S123-36. [PMID: 30109304] ]. Several surface modifications have been applied and subsequently tested in animal and human studies [11Lang NP, Salvi GE, Huynh-Ba G, Ivanovski S, Donos N, Bosshardt DD. Early osseointegration to hydrophilic and hydrophobic implant surfaces in humans. Clin Oral Implants Res 2011; 22(4): 349-56. [http://dx.doi.org/10.1111/j.1600-0501.2011.02172.x] [PMID: 21561476] -17Favero R, Botticelli D, Antunes AA, Martinez Sanchez R, Caroprese M, Salata LA. Sequential healing at calcium versus calcium phosphate modified Titanium implant Surfaces: An experimental study in dogs. Clin Implant Dent Relat Res 2016; 18(2): 369-78. [http://dx.doi.org/10.1111/cid.12311] [PMID: 25727337] ]. Altering surface characteristics by increasing its energy and hydrophilicity will accelerate the interaction between cells and implant surface [18Sawase T, Wennerberg A, Hallgren C, Albrektsson T, Baba K. Chemical and topographical surface analysis of five different implant abutments. Clin Oral Implants Res 2000; 11(1): 44-50. [http://dx.doi.org/10.1034/j.1600-0501.2000.011001044.x] [PMID: 11168193] -23Duske K, Koban I, Kindel E, et al. Atmospheric plasma enhances wettability and cell spreading on dental implant metals. J Clin Periodontol 2012; 39(4): 400-7. [http://dx.doi.org/10.1111/j.1600-051X.2012.01853.x] [PMID: 22324415] ]. The energy and hydrophilicity tend to disappear over a short time for an electrostatic status change and a contamination of the surface by hydrocarbons [24Att W, Hori N, Takeuchi M, et al. Time-dependent degradation of titanium osteoconductivity: An implication of biological aging of implant materials. Biomaterials 2009; 30(29): 5352-63. [http://dx.doi.org/10.1016/j.biomaterials.2009.06.040] [PMID: 19595450] , 25Hori N, Att W, Ueno T, et al. Age-dependent degradation of the protein adsorption capacity of titanium. J Dent Res 2009; 88(7): 663-7. [http://dx.doi.org/10.1177/0022034509339567] [PMID: 19641155] ]. However, the implant surface may be reactivated and the use of argon plasma is one of the possible treatments [21Canullo L, Genova T, Tallarico M, Gautier G, Mussano F, Botticelli D. Plasma of argon affects the earliest biological response of different implant surfaces: An in vitro comparative study. J Dent Res 2016; 95(5): 566-73. [http://dx.doi.org/10.1177/0022034516629119] [PMID: 26848069] ]. Cleaning and activation with argon plasma increase surface energy, promote cells spreading [23Duske K, Koban I, Kindel E, et al. Atmospheric plasma enhances wettability and cell spreading on dental implant metals. J Clin Periodontol 2012; 39(4): 400-7. [http://dx.doi.org/10.1111/j.1600-051X.2012.01853.x] [PMID: 22324415] ] and modify the oxide layers that interact with proteins and cells adhesion [26Zhao G, Schwartz Z, Wieland M, et al. High surface energy enhances cell response to titanium substrate microstructure. J Biomed Mater Res A 2005; 74(1): 49-58. [http://dx.doi.org/10.1002/jbm.a.30320] [PMID: 15924300] ]. In an experimental study in dogs, the surface of the implant at the test sites was treated with argon plasma while the control implants were left without treatment. The healing was studied after one and two months from implant installation. It was shown that, after 2 months of healing, a higher percentage of new bone was found on the surfaces of the test compared to the controls sites. From a mechanical point of view, bone-to-implant contact should not be considered the only important factor that allows a good stability of the implant over time. Given that bone integrated on the implant surface is anchored to the surrounding bone, bone density around the implants constitutes an important factor that may influence implant stability over time. The implant surface may influence bone density around the implant. In an experiment in dogs [27Caroprese M, Lang NP, Baffone GM, Ricci S, Caneva M, Botticelli D. Histomorphometric analysis of bone healing at implants with turned or rough surfaces: An experimental study in the dog. J Oral Sci Rehabil 2016; 2(4): 74-9. ], implants either with a moderately rough surface (Sa 1.4) or a turned surface (Sa 0.6) were installed in edentulous mandibles. A higher bone-to-implant contact percentage (BIC%) was observed at the rough compared to the turned surfaces while a divergent outcome was seen for bone density. When all implants were considered, a low correlation was found between BIC% and bone density (r = 0.3). However, when turned and rough surfaces were considered separately, the turned surface presented an r = 0.8, while the rough surface did not show correlation at all (r = 0.02). This allows to speculate that some surface configuration may influence also the response of the bone tissue around the implant beside osseointegration. Hence, the aim of the present randomized, controlled animal study was to compare bone density around implants with the surface either treated or not with argon plasma. The research protocol was submitted to and approved by the local Ethical Committee for Animal Research at the University of the State of São Paolo, Ribeirão Preto, Brazil (#2013.1.1194.58.0). The present animal study adhered to the ethical guidelines of the Basel Declaration 2010. The study followed the ARRIVE guidelines [28Kilkenny C, Browne WJ, Cuthill IC, Emerson M, Altman DG. Improving bioscience research reporting: The ARRIVE guidelines for reporting animal research. PLoS Biol 2010; 8(6): e1000412. 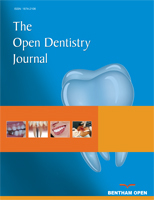 [http://dx.doi.org/10.1371/journal.pbio.1000412] [PMID: 20613859] ]. Details on implant surface preparation, surgical procedures, marginal hard/soft issue dimensions and osseointegration can be found in previous published articles. Briefly, the surface of the implants used at the test sites was treated for 12 min at room temperature with plasma of argon in a plasma reactor (Diener electronic, Jettingen, Germany, parameters: 75 W power; −10 mbar pressure). The plasma reactor is a device with a metallic structure inside a vacuum chamber. This is used a cathode and is able to electrify the inert gas (Argon) creating the plasma, which was demonstrated to change the electronic mantle of the implant [29Tavares JCM, Cornélio DA, da Silva NB, et al. Effect of titanium surface modified by plasma energy source on genotoxic response in vitro. Toxicology 2009; 262(2): 138-45. [http://dx.doi.org/10.1016/j.tox.2009.05.020] [PMID: 19520141] ]. Eight Beagle dogs were included in the experiment. At each surgical session, the dogs were pre-anesthetized with Acepran® 0.2% (0.05 mg/Kg - Univet-vetnil, São Paulo, Brazil), and sedated with Zoletil® 10 mg/Kg (Virbac, EUA). The anesthesia was maintained with inhalation of Isoflurane® (Baxter Hospitalar Ltd., Sao Paulo, Brazil). Premolars and first molar were extracted bilaterally and no grafting procedures were applied to the alveoli. Three months later, four implants (Premium™, Sweden & Martina, Due Carrare, Padua) with a moderately ZirTi surface (Sa 1.4) [27Caroprese M, Lang NP, Baffone GM, Ricci S, Caneva M, Botticelli D. Histomorphometric analysis of bone healing at implants with turned or rough surfaces: An experimental study in the dog. J Oral Sci Rehabil 2016; 2(4): 74-9.] were installed in one side of the mandible. Two implants had the surface treated with argon plasma, while two implants were left untreated. Abutments were screwed onto the implants and a non-submerged healing was allowed. After one month, the same procedure was performed in the other hemimandible. Euthanasia was performed after one month from the last surgery using an overdose of Thiopental® (Cristalia Ltd., Campinas, Brazil) and 25 meq of potassium chloride i.v. Antibiotic treatment for 10 days (Stomorgyl 10®, one tablet/10 Kg daily – Merial Saude Animal Ltd., Paulinia, Brazil), anti-inflammatory drugs for 5 days (Maxicam® 2.0 mg, one tablet/20 Kg daily – Ouro Fino Saude Animal Ltd., Cravinhos, Brazil), and analgesic for 3 days (Tramal 50 mg®, 4.0 mg/Kg subcutaneous, every 8 hours – União Quimica Farmaceutica Nacional S/A, Pouso Alegre, Brazil) were provided after each surgery. The animals were maintained in kennels at the university field laboratory. They had free access to water and were a feed of moistened balanced dog chow. Inspection of the wounds for clinical signs of complications and cleaning were performed daily. Block containing implants were prepared and fixed in 4% formaldehyde solution. The blocks were dehydrated in a series of graded alcohol solutions, and subsequently embedded in resin (LR White® hard grade, London Resin Company Ltd, Berkshire, UK). After polymerization, buccolingual histologic slides were prepared and stained with Stevenel’s blue and alizarin red. A trained examiner was first calibrated with an expert (DB) and the inter-rater agreement reached K > 0.80. The examiner was blind about the protocol and no information was attached to the histological slides to recognize treatment of periods of healing. Measurements were performed twice at x200 magnification using an optical microscope. Morphometric analyses were performed in a region included within the three most coronal complete threads to a distance of about 0.4 mm from the implant surface. The following tissues were identified: new bone, old pre-existing bone, soft tissues (mainly bone marrow), and vessels. Total mineralized bone was calculated as the sum between new and old bone. An electronic randomization (randomization.com) was performed for sides of the mandible, for the first implant surgery. The allocation of the implants was based on the surface treatment. The assignment was performed using opaque envelopes containing the generated unique randomization code. The envelope was opened immediately before implants placement. Measurements were performed twice and mean values were used. Mean values were subsequently obtained between the buccal and lingual aspect. Mean values, standard deviation and 95% Confidence Intervals (CI) of the difference of the means were calculated for each variable. All measurements were rounded to the nearest decimal. Data were pooled for surface treatment. The primary variable was the new bone. Differences between treated (test) and non-treated (control) implants were analyzed using the Wilcoxon test. All statistical comparisons were performed at the 0.05 level of significance. Two untreated implants, one of the 1-month group and one of the 2-month group, and one treated implant of the 2-month group were found not integrated or lost. After 1 month of healing (Figs. 1a , b and 2 ; Table 1), new bone was occupying 32.5 ± 12.2% of the evaluated region at the treated implants (test sites) while the corresponding value at the untreated implants (control site) was 33.8 ± 8.8% (p = 0.674 between test and control sites; (Table 2). Microphotographs of ground sections representing the healing after 1 month at (A) untreated and treated (B) implant surfaces. New bone (yellow stars) was found interposed between the implant surface and old bone (light blue stars). Graph illustrating histomorphometric evaluation of tissues components in percentage (%) after 1 and two months of healing at untreated (CTRL, control) and treated (TEST) sites. n=8. Histomorphometric evaluation of tissues components after 1 month of healing. n=8. Mean values, Standard Deviation (SD) and lower and upper 95% confidence intervals (CI) of the difference of the means between treated and untreated implants. n=8. Old pre-existing bone was 15.4 ± 6.2% and 15.44 ± 8.5% at the test and control sites (p = 1.000), respectively. The total mineralized bone was 47.9 ± 12.6% at the test sites, and 49.2 ± 13.7% at the control sites (p = 0.889). After 2 months (Figs. 2 and 3a , b ; Table 3), the newly formed bone was represented by 50.8 ± 21.5% at the test sites and 47.6 ± 15.6% at the control sites (p = 0.674; Table 2). 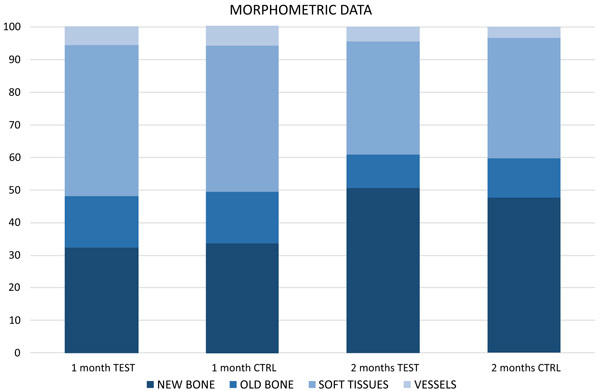 Old pre-existing bone decreased to 10.2 ± 5.8% and 12.0 ± 8.1% at the test and control sites (p = 0.575), respectively. The total mineralized bone was 61.0 ± 24.2% at the test sites, and 59.6 ± 8.1% at the control sites (p = 0.889). Microphotographs of ground sections representing the healing after 2 months at (A) untreated and treated (B) implant surfaces. Lower amounts of old bone (light blue stars) are still visible while new bone (yellow stars) is represented by higher percentages compared the previous period of healing. Histomorphometric evaluation of tissues components after 2 months of healing. n=8. No statistically significant differences were disclosed between treated and untreated implants for any of the variables analyzed. The aim of the present study was to assess bone density around titanium implants cleaned and activated by argon plasma. No differences were found for any of the variables analyzed. The present study showed that the treatment of the implant surface with argon plasma did not affect bone density around the implants as the same treatment had for bone apposition on the implant surface [30Canullo L, Tallarico M, Botticelli D, Alccayhuaman KAA, Martins Neto EC, Xavier SP. Hard and soft tissue changes around implants activated using plasma of argon: A histomorphometric study in dog. Clin Oral Implants Res 2018; 29(4): 389-95. [http://dx.doi.org/10.1111/clr.13134] [PMID: 29453788] ]. In the present study, the evaluation was performed in the marrow region. After 2 months of healing, 50.8% and 47.6% of newly formed bone were found at the treated and untreated implant sites, respectively. These data are similar to another histomorphometric experiment in dogs [31Favero V, Lang NP, Rossi F, Favero R, Baffone D, Botticelli D. Peri-implant tissues morphometry at SLActive surfaces. An experimental study in the dog. Clin Oral Implants Res 2016; 27(8): 993-8.] in which, after 60 days, 50.4% of new bone was present. Despite the absence of loading, bone density increased between 1 and 2 months of healing. This is in agreement with other studies that evaluated bone density at implants at various periods of healing. In experimental studies in dogs [32Favero V, Lang NP, Favero R, Carneiro Martins Neto E, Salata LA, Botticelli D. Sequential morphometric evaluation at UnicCa® and SLActive® implant surfaces. An experimental study in the dog. Clin Oral Implants Res 2017; 28(9): 1023-9., 33Favero V, Lang NP, Favero R, Antunes AA, Salata LA, Botticelli D. Sequential morphometric evaluation at UnicCa® and DCD® implant surfaces. An experimental study in the dog. Clin Oral Implants Res 2017; 28(7): 833-9. ], different implant surfaces were evaluated after 1, 2, 4, and 8 weeks of submerged healing. New bone density was found increasing in percentages over time. After 1 week, new bone ranged between 7-10%, after 2 weeks increased to 28-43%, after 4 weeks reached 49-56% and after 8 weeks was ranging between 67 and 77%. Once the implants are installed in a bone, a strong cellular reaction is expected. In an experiment in dogs, implants were installed in edentulous mandibles and the healing was studied after 5, 10, 20, and 30 days [1Rossi F, Lang NP, De Santis E, Morelli F, Favero G, Botticelli D. Bone-healing pattern at the surface of titanium implants: An experimental study in the dog. Clin Oral Implants Res 2014; 25(1): 124-31. [http://dx.doi.org/10.1111/clr.12097] [PMID: 23289845] ]. A cellular reaction in the marrow compartment, about 1 mm wide, was seen during the earliest phases of healing. In the following periods of healing, bone was formed progressively around the implant body. The cellular reaction observed may be referred to the surgical trauma but also to the installation of a titanium implant. In an experimental study [2Trindade R, Albrektsson T, Galli S, Prgomet Z, Tengvall P, Wennerberg A. Osseointegration and foreign body reaction: Titanium implants activate the immune system and suppress bone resorption during the first 4 weeks after implantation. Clin Implant Dent Relat Res 2018; 20(1): 82-91. [http://dx.doi.org/10.1111/cid.12578] [PMID: 29283206] ], two osteotomies were prepared in the femur of rabbits: in the first, one implant was installed, while the other sites were used as a control with no implant insertion. Biopsies were harvested after 10 and 28 days. It was found that titanium implants activated the immune system and suppressed bone healing. It was concluded that bone formation around the titanium surface can be interpreted as an attempt to isolate the implant from the bone marrow space. This also may justify the presence of the intense cellular reaction around implants showed in an experiment in dogs [1Rossi F, Lang NP, De Santis E, Morelli F, Favero G, Botticelli D. Bone-healing pattern at the surface of titanium implants: An experimental study in the dog. Clin Oral Implants Res 2014; 25(1): 124-31. [http://dx.doi.org/10.1111/clr.12097] [PMID: 23289845] ]. 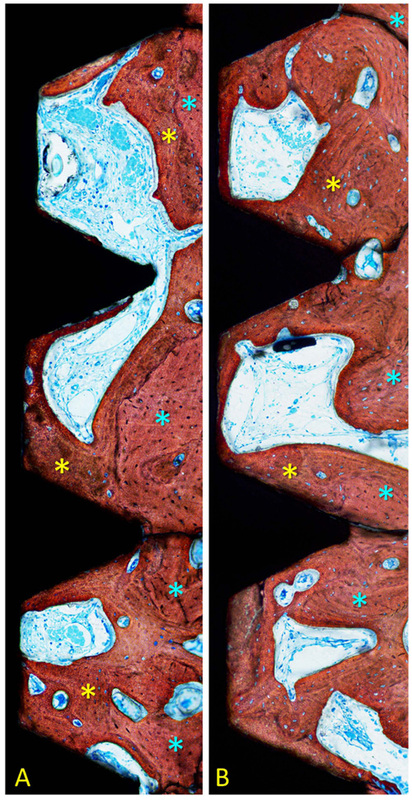 In another experiment in dogs, the early phases of bone formation in the cortical and marrow compartments were studied in submerged implants [34Caroprese M, Lang NP, Rossi F, Ricci S, Favero R, Botticelli D. Morphometric evaluation of the early stages of healing at cortical and marrow compartments at titanium implants: An experimental study in the dog. Clin Oral Implants Res 2017; 28(9): 1030-7.[http://dx.doi.org/10.1111/clr.12913.] [PMID: 27354261.] ]. In the cortical compartment, new bone density was 0.6%, 2.5%, 16% and 23.3% after 5, 10, 20, and 30 days, respectively. The corresponding percentages of new bone density in the marrow compartment were 10.8%, 34.6%, 45.5% and 56.4%, respectively. The differences between cortical and marrow compartment were statistically significant. This supported the assumption that also new bone density increases faster in empty spaces compared to the cortical regions, as occurred for bone apposition on implant surface [1Rossi F, Lang NP, De Santis E, Morelli F, Favero G, Botticelli D. Bone-healing pattern at the surface of titanium implants: An experimental study in the dog. Clin Oral Implants Res 2014; 25(1): 124-31. [http://dx.doi.org/10.1111/clr.12097] [PMID: 23289845] , 35Abrahamsson I, Berglundh T, Linder E, Lang NP, Lindhe J. Early bone formation adjacent to rough and turned endosseous implant surfaces. An experimental study in the dog. Clin Or7al Implants Res 2004; 15(4): 381-92.]. A load applied to the implant may affect both bone-to-implant contact and bone density around the implant. In an experiment in dogs [36Rea M, Botticelli D, Ricci S, Soldini C, González GG, Lang NP. Influence of immediate loading on healing of implants installed with different insertion torques: An experimental study in dogs. Clin Oral Implants Res 2015; 26(1): 90-5. ], implants were installed with different torque values, about 70 Ncm of about 30 Ncm, and were immediately loaded at the sites or left unloaded at the control sites. Higher bone-to-implant contact and bone density were found at the loaded sites, in both 30 and 70 Ncm group. In another experiment in dogs [37Mainetti T, Lang NP, Bengazi F, Sbricoli L, Soto Cantero L, Botticelli D. Immediate loading of implants installed in a healed alveolar bony ridge or immediately after tooth extraction: An experimental study in dogs. Clin Oral Implants Res 2015; 26(4): 435-41. ], implants were installed in healed sites or into extraction sockets and immediately loaded. Bone density increased at both healed site and post-extraction sites between 1 week and 3 months of healing. In the present study, tissues were evaluated at a distance of about 0.4 mm from the implant body. Old bone was still present after 2 months of healing and decreased 3-5% compared to the first month of healing. During the same interval, new bone increased 14-18%, so that the density of total bone increased between 1 and 2 months of healing both at the treated and untreated implants. 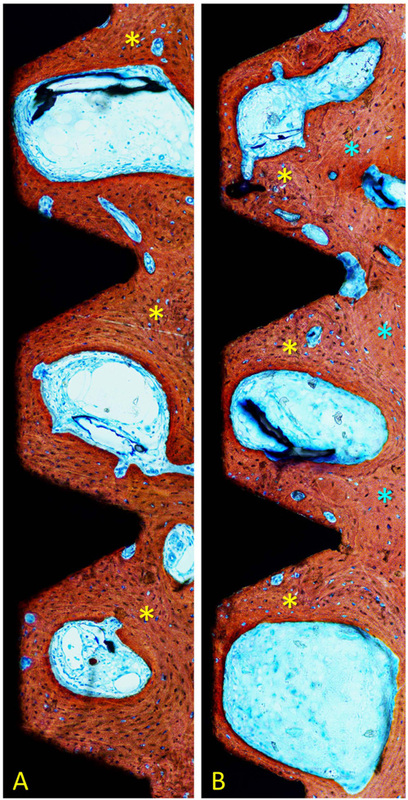 The increased density of total mineralized bone around implant in the marrow compartment was also shown in an experiment in dogs previously presented [1Rossi F, Lang NP, De Santis E, Morelli F, Favero G, Botticelli D. Bone-healing pattern at the surface of titanium implants: An experimental study in the dog. Clin Oral Implants Res 2014; 25(1): 124-31. [http://dx.doi.org/10.1111/clr.12097] [PMID: 23289845] , 34Caroprese M, Lang NP, Rossi F, Ricci S, Favero R, Botticelli D. Morphometric evaluation of the early stages of healing at cortical and marrow compartments at titanium implants: An experimental study in the dog. Clin Oral Implants Res 2017; 28(9): 1030-7.[http://dx.doi.org/10.1111/clr.12913.] [PMID: 27354261.] ]. It must be highlighted that the effect of plasma of Argon on implant surfaces increases their wettability and this effect is directly correlated to the surface roughness [21Canullo L, Genova T, Tallarico M, Gautier G, Mussano F, Botticelli D. Plasma of argon affects the earliest biological response of different implant surfaces: An in vitro comparative study. J Dent Res 2016; 95(5): 566-73. [http://dx.doi.org/10.1177/0022034516629119] [PMID: 26848069] ]. From a microscopical point of view, plasma of Argon treatment (at least with the power and pressure analyzed during this study) cannot change the microstructure of the implant surface [21Canullo L, Genova T, Tallarico M, Gautier G, Mussano F, Botticelli D. Plasma of argon affects the earliest biological response of different implant surfaces: An in vitro comparative study. J Dent Res 2016; 95(5): 566-73. [http://dx.doi.org/10.1177/0022034516629119] [PMID: 26848069] ]. This might help to explain the absence of significant effect on bone density around implants treated with plasma of Argon. In conclusion, the treatment of the implant surface with argon plasma did not have a significant effect on bone density around implants. As limitations of the present study should be included, the short follow-up that may have failed to disclose differences and the absence of load. The failure in integration of three implants, two untreated and one treated, is another limitation that should be considered. However, two control and two test implants were used in each period of healing so that n = 8 for each variable could be maintained. Further experimental studies should be performed to evaluate if the surface treatment applied in the present experiment is equally effective when compared to other surface treatments. Human studies should be performed to confirm the clinical relevance of the surface treatment discussed in the present report. The research protocol was submitted to and approved by the local Ethical Committee for Animal Research at the University of the State of São Paolo, Ribeirão Preto, Brazil (#2013.1.1194.58.0). No humans were used for studies that are the basis of this research. The present animal study adhered to the ethical guidelines of the Basel Declaration 2010. The study followed the ARRIVE guidelines. This study was supported by a grant (number 2014/04371-6) from São Paulo Research Foundation and by ARDEC Academy, Ariminum Odontologica srl, Rimini, RN, Italy. The authors wish to express their appreciation to Mr. Sebastião Bianco (University of São Paulo, Ribeirão Preto, Brazil) for the preparation of the histological slides and to Dr. Dailin Urbizo Obiol (University of Medical Science, Faculty of Dentistry, Havana, Cuba) for the histological measurements. Implants were provided free of charge by Sweden & Martina, Due Carrare, PD, Italy. Authors greatly appreciated the help and the commitments of Dr. Audrenn Gautirer for language supervision. Caroprese M, Lang NP, Baffone GM, Ricci S, Caneva M, Botticelli D. Histomorphometric analysis of bone healing at implants with turned or rough surfaces: An experimental study in the dog. J Oral Sci Rehabil 2016; 2(4): 74-9. Favero V, Lang NP, Rossi F, Favero R, Baffone D, Botticelli D. Peri-implant tissues morphometry at SLActive surfaces. An experimental study in the dog. Clin Oral Implants Res 2016; 27(8): 993-8. Favero V, Lang NP, Favero R, Carneiro Martins Neto E, Salata LA, Botticelli D. Sequential morphometric evaluation at UnicCa® and SLActive® implant surfaces. An experimental study in the dog. Clin Oral Implants Res 2017; 28(9): 1023-9. Favero V, Lang NP, Favero R, Antunes AA, Salata LA, Botticelli D. Sequential morphometric evaluation at UnicCa® and DCD® implant surfaces. An experimental study in the dog. Clin Oral Implants Res 2017; 28(7): 833-9. Abrahamsson I, Berglundh T, Linder E, Lang NP, Lindhe J. Early bone formation adjacent to rough and turned endosseous implant surfaces. An experimental study in the dog. Clin Or7al Implants Res 2004; 15(4): 381-92. Rea M, Botticelli D, Ricci S, Soldini C, González GG, Lang NP. Influence of immediate loading on healing of implants installed with different insertion torques: An experimental study in dogs. Clin Oral Implants Res 2015; 26(1): 90-5. Mainetti T, Lang NP, Bengazi F, Sbricoli L, Soto Cantero L, Botticelli D. Immediate loading of implants installed in a healed alveolar bony ridge or immediately after tooth extraction: An experimental study in dogs. Clin Oral Implants Res 2015; 26(4): 435-41.